At the Home screen, press the Menu button and choose the Settings command. Choose the Lock Screen item. You see various commands and options for the Galaxy Note’s lock screen. The Shortcuts item allows you to add a row of apps to the bottom of the lock screen. You can run an app by swiping the app icon upward as you unlock the phone. That app immediately launches. After choosing the Shortcuts item, slide its master control to the right. When the master control is green, lock screen shortcuts are active. You can then choose which shortcuts to use: Touch a shortcut icon on the Shortcuts screen to replace it with another, favorite app. To activate lock screen widgets, choose the Multiple Widgets item. Slide the master control to the On, or green, setting. You can choose to use the Favorite Apps widget or Camera widget. There is even an option for the Favorite Apps widget. To add new widgets, touch the Add button. Choose a new lock screen widget from the scrolling list. 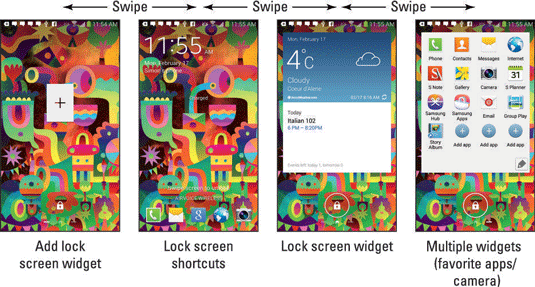 The lock screen widgets are accessed by swiping the lock screen left and right. You must swipe on the displayed time, which appears at the top of the lock screen. Otherwise, your swipe may just unlock the phone. Also, when viewing a widget, swipe the lock icon at the bottom of the screen to unlock the phone. To remove a lock screen widget, long-press it. Drag the widget up to the Remove icon and it’s gone. You can even remove the Clock widget, in which case only the large plus-sign icon appears on the Lock screen.